Ever eat a tree? I know, I sound like Euell Gibbons. 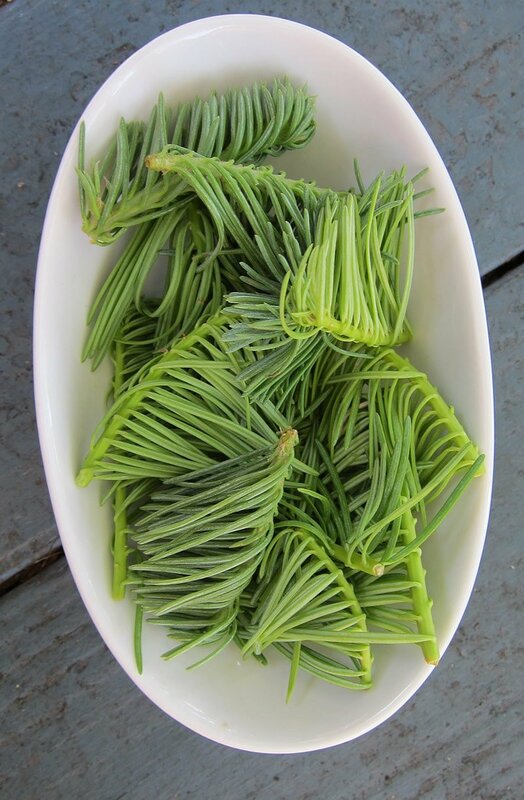 But really, you can eat the fresh growing tips of spruce or fir trees in any number of ways. My favorite is steeped in a simple syrup. The syrup smells like a pine forest, tastes a little citrusy — moreso if you add lemon juice — and adds a wonderful woodsy note to glazed pheasant, grouse or chicken. Spruce tip syrup is even better mixed with ice cold water, carbonated or no, and a hint of lime or lemon juice. And it makes a fascinating cocktail mixed with gin. To gather spruce or fir tree tips, look in springtime for the light-colored ends of the trees: These are the new growth shoots from the tree. Older shoots get too resinous to be very tasty. Work your way around the tree and pick from scattered places so you don’t damage the tree — and never pick the top of a young tree, or you can possibly stunt its future growth. This syrup should be kept in the fridge, where it should last about 4 months. Note that most conifers can be used here: spruce, fir, pine, redwood. Flavor is very variable from tree to tree and species to species. Be very careful not to pick from the yew, which is a common landscaping plant in the US. It is highly toxic. Bring the sugar and water to a boil in a lidded pot, stirring to make sure all the sugar is absorbed. When it hits a boil, turn off the heat. 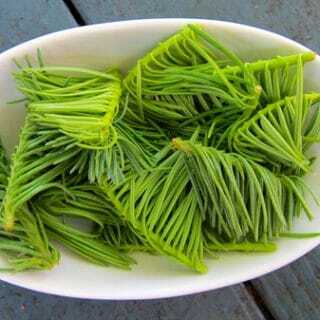 Stir in the spruce tips, cover the pot and leave to cool. The longer you steep the syrup, the stronger spruce flavor you'll get. I let it steep overnight. Strain the syrup through cheesecloth, add lemon juice (if using) to taste and bottle.